Everybody wants to jump on the bandwagon to gain better health from coconut oil. But do you know how best to eat it to reap its health benefits? You can eat it raw, or cook your food with it, or take coconut oil capsules. However, no matter which way you choose to eat coconut oil, especially if you're just getting started, you should always start off with a small amount. Why? That's because eating too much coconut oil can trigger diarrhea. Although this is actually a detox reaction from coconut oil, you wouldn't want to experience such an effect unless you're really suffering from severe constipation. So, it's always good to begin with just a small quantity like one teaspoon per day. And gradually build up your intake over the next few weeks before you reach up to the recommended amount (at least 3 tablespoons) of coconut oil daily for true health benefits. Enough of the precaution, now let's get down to each way of eating coconut oil for health benefits. When I say 'raw', it means uncooked or in its most original form. Yes, you should ingest coconut oil this way so that you can obtain the greatest health benefits out of it. Though coconut oil is very stable due to its predominant saturated fats, heat (especially the one with temperatures around 220 °F or 104 °C) may mark down its health benefits a bit. This is because this is the temperature that manufacturers use to vaporize its distinctive coconut scent in order to make coconut oil odorless and flavorless. I mentioned in Coconut Oil Benefits that it is the intrinsic phytonutrients called lactones that render coconut oil its natural odor. So, if you need the odor removed, you definitely have to sacrifice the nutrients that give off the odor. On top of that, don't forget that coconut oil contains about 8–10% unsaturated fats that are unstable and may oxidize even at low heat. It's true that they're surrounded and protected against oxidation by the 80–90% saturated fats. But the protection is never perfect as long as heat is present and particularly when it reaches certain temperature levels like 220 °F (104 °C). So, the best way to consume coconut oil for health benefits is just add it to any food (including beverages) be it raw or cooked. As for cooked food, add coconut oil just before serving, not during cooking. The rising steam in the cooked food may carry away some molecules of coconut oil with it into the air. But that really does not matter since the loss of coconut oil (more to the point, its health properties) in such situation is extremely minimal. The nice fragrance from coconut oil (if you use virgin coconut oil) is still there. Or if you're adventurous enough and can stand the oily mouthfeel, you can eat coconut oil straight out of the jar... no mixing with food or drinks. But eating coconut oil straight from the jar especially when your stomach is empty may cause stomach cramp or other discomforts. Also, as it's slightly acidic (pH 5), it can "bite" the back of your throat. So, beware. I add coconut oil raw to literally all my food and drinks. I cook my food with coconut oil too. This is how I consume coconut oil to gain as much health benefits as I could. But didn't I just say that heat may cause the loss of some beneficial properties in the oil, so why cook? Let me ask you, which is more detrimental to your health, 8% unsaturated fats or 95% unsaturated fats? Most vegetable oils you're using right now for cooking carry more than 95% or even 100% unsaturated fats. Cooking with these oils even at low heat like 113 °F (45 °C) will cause the oils to oxidize easily and lose their original health properties, not to mention cooking at 220 °F (104 °C). As a matter of fact, they oxidize the moment you expose them to air. I'm not trying to scare you. It's true. Oxidized oils are extremely toxic and damaging to health. 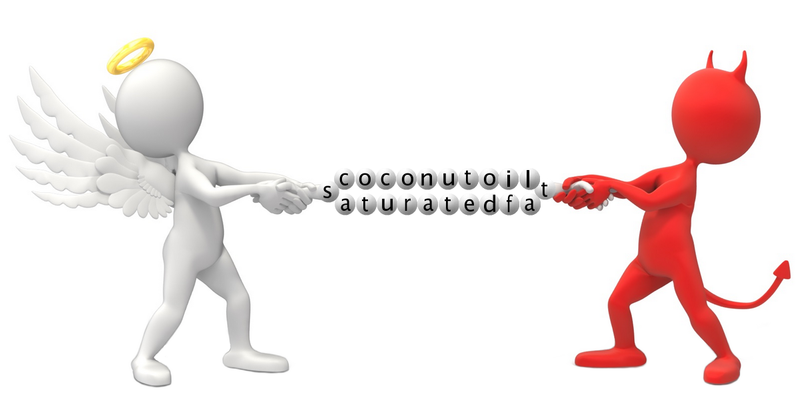 However, oxidation on coconut oil may OR may not occur during cooking since that very much smaller amount (8–10%) of unsaturated fats are widely separated and diluted by the predominant saturated fats. But that doesn't mean they won't oxidize, it all depends on how hot the cooking temperature is. The higher the cooking temperature, the greater will be its probability of oxidation. Even when these unsaturated fats in coconut oil oxidize, they won't effect any severe chain reaction because they're too spatially spread apart, not like other oils that carry mostly unsaturated fats. Which means coconut oil gets to retain most of its health properties and you're still gaining quite a massive health benefits from eating food cooked with coconut oil. That's why I always say that cooking with coconut oil does not cause much of its health values or benefits to lose unless you really heat it up to its smoke point at 350 °F (177 °C) where its health properties start to break down. Unless you eat 100% raw food, you can't avoid cooking food. So, why use unhealthy oil for cooking when there is a better and healthier option available for you? You can use minimal coconut oil for cooking first, then before serving add more coconut oil in its most original form to the cooked food (I always do this). This will make sure you're getting maximum health benefits from coconut oil rather than cooking with unsaturated oil first and then add coconut oil to the food before serving. Not only that, I found that doing so actually has one super advantage that no other oils can match. That is, the dominating saturated fats in coconut oil can help the food to preserve its nutrients. You can easily lose or destroy the nutrients in food during cooking because of the heat. But when you "coat" them with a layer of coconut oil, the anti-oxidative saturated fats in coconut oil will protect the nutrients against oxidation and environmental destruction. Which is why when you leave the food (cooked or mixed with coconut oil) out even for long hours the taste remain unchanged. This is so unlike food which is cooked with oils that carry mostly unsaturated fats – it will turn rancid and taste stale even in refrigerator. That means, you're getting not just the health benefits of coconut oil, but also a lot more nutritional benefits from food when you eat the food cooked with coconut oil as well. Awesome, huh? If you bake with coconut oil, you might worry that baking food at temperatures higher than the oil's smoke point will break its health properties. Actually, it won't happen in most cases because the moisture in the food will help to keep the inside temperature below the smoke point. Did you know that coconut oil comes in capsule (softgel) form too? Coconut oil in capsules may seem like a supplement, but don't treat it that way. If you eat it like a supplement, you won't get much health benefits from it. This is because you wouldn't take a supplement in great amount, would you? One tablespoon of coconut oil contains 14 grams and one capsule holds 1 gram (i.e. 1000 mg). So, one tablespoon of coconut oil equals to about 14 caps. If you want to truly benefit from coconut oil's amazing health properties, you should at least eat 3 tablespoons a day, which equates to 42 caps per day. Can you imagine yourself popping 42 capsules into your mouth every day? That's sheer crazy! And it's not cheap to eat coconut oil in capsules though because packing in softgel involves additional cost. Another implicit disadvantage is that the oil may have turned rancid right within that little bolus without your notice. Unless you randomly take the time and effort to sample them by cutting open some softgels to examine the quality of the oil. If it doesn't smell like coconut but instead, smells like cheese or vomit or something else, then the oil has turned bad. And eating it will cause more harm than good to your health. Unless you're always on the move (like a road warrior) and so busy that you need such capsuled coconut oil for great convenience (pop it anywhere, anytime), I suggest that you eat coconut oil from jar so that you can take more coconut oil for greater health benefits and stronger protection against viruses, bacteria and other super germs without burning a hole in your pocket. Animal-derived gelatin that is used to make the capsule may contain antibiotic and hormone residues. To make matters worse, some may even get contaminated with diseased animal tissues. Hence, it's best to buy coconut oil that is wrapped in veggie capsules if you need it in capsule form. No matter which way you choose to eat coconut oil, remember to take enough of it or you won't see much of your health improving. And keep in mind to start with a small amount first to avoid the common side effects of coconut oil that many people have experienced as a newbie. Oh, something I experienced earlier just flits across my mind. When your body is ready for more coconut oil, try to take more during the day and cut back on its quantity during dinner. That's because coconut oil can generate thermogenic effect that increases your metabolism. When metabolism increases, it raises your overall body temperature and may affect your sleep quality. Our body temperature needs to get down a bit for preparation of sleep. Even if you do doze off after a high dose of coconut oil during dinner, your sleep quality might not be that good as you'll probably only enter light sleep and get awakened easily in the middle of the night. To give you an idea based on the recommended 3 tablespoons per day, you should ingest 1 tablespoon with your breakfast, 1½ tablespoons with lunch, and 1/2 tablespoon with dinner. Or 2 tablespoons in the morning and 1 in the afternoon with meals. In short, whatever combination you do, keep your intake of coconut oil minimal during the evening if you want to sleep like a bear at night. I am wondering when is the best time to take coconut oil. Early morning before breakfast and drinking? Early morning one hour after drinking water but before breakfast? With breakfast even if i only eat fruits. Then second dose before lunch or with lunch? Since I would like to take ghee as well. Is it OK if I have coconut oil and ghee with meals? Should they be taken at separate times. Hi Radhika, if you treat coconut oil like a supplement, you won't gain much benefits from it. That said, you should take coconut oil with food since coconut oil is a food itself. Like adding to your meals. Yes, you can mix coconut oil into your ghee too. Many people are doing that.